Note: Longer articles are normally reserved for publication in the Tristan da Cunha Newsetter, which is published twice-yearly in February and August and posted to members of the Tristan da Cunha Association. The article below is the first part of a longer report from Peter Ryan about conservation work on Inaccessible Island in the February 2019 edition. See the Association pages for information on the newsletter and how to join. The Tristan archipelago has several claims to fame, but one of the more obscure is being home to the smallest surviving flightless bird in the world - the Inaccessible Island Rail. The rail was well known to the Stoltenhoff brothers, who spent two years on Inaccessible Island in the 1870s, but they were unable to show it to members of the Challenger Expedition who rescued the brothers from their self-imposed exile on Inaccessible Island. Moseley, the Challenger's naturalist, thought it very unlikely that the rail on Inaccessible could differ from the flightless moorhen on Tristan, and ignored their claims. As a result, the Inaccessible Rail was only described in 1923 by British physician Percy Lowe, based on a specimen sent back to the UK by the Reverend Rogers. The species' tiny wings and soft, fluffy plumage appeared so different from other rail species that Lowe placed it in its own genus, Atlantisia, inspired by the mythical island Atlantis. The species name, rogersi, recognises its collector (although the specimen was probably collected by an islander). showing why the bird is so difficult to find. The rail is confined to Inaccessible Island. Lowe suggested that the loss of flight was an ancient feature, and that the rail's ancestors probably colonized Inaccessible Island by foot, on land bridges or now sunken continents (hence the allusion to Atlantis). We now know that this is very unlikely - rails often lose the power of flight once they reach oceanic islands, in part because they only develop flight fairly late in their development as chicks, and thus it is easy for them to evolve into fl ightless forms. Also, Inaccessible Island is only a few million years old, and has never been connected to another land mass. Flightless rails have evolved in virtually all habitats that lacked eutherian (placental) mammals; they were able to coexist at least locally with some marsupials. It was originally thought that rails arriving on islands lost the power of flight to avoid being blown away, but Brian McNab has shown how flightlessness is first and foremost a way to reduce energy demand. Flightless rails need almost one third less energy to survive than do rails that can fly, because of the cost of developing and maintaining large flight muscles. Consequently they soon lose the ability to fly once the need to escape predators disappears. Unfortunately, it is not easy to go back to being able to fly, and so flightless rails have experienced perhaps the highest rate of extinction of any group of birds over the last few thousand years. Based on sub-fossil remains at oceanic islands, it is estimated that there were up to 1600 species of flightless rails around the world prior to the arrival of humans and their commensals. Almost all of these have since gone extinct, including species on St Helena, Ascension and the main island of Tristan. The only reason why the rail survives on Inaccessible is that mammalian predators have not been introduced to the island (the feral pigs that once roamed the island almost wiped out the population of Spectacled Petrels or Ringeyes, but the rails were too small and likely too fast to feature prominently in the pig's diet). Since Lowe's day, scientists have struggled to infer whether the ancestor of the rail came from Africa or South America. The rail family has many look-alike species, which have repeatedly fooled taxonomists to draw incorrect conclusions about their relationships. Modern genetic techniques provide a more robust insight into the evolutionary history of species. Using next generation sequencing, Martin Stervander and his colleagues were able to finally solve the mystery in a study published in the scientific journal Molecular Phylogenetics and Evolution. Stervander's PhD at Lund University focused on the evolution of island birds. He visited Inaccessible Island in 2011 to study the island's fascinating finch radiation, but he also collected a blood sample from a rail. 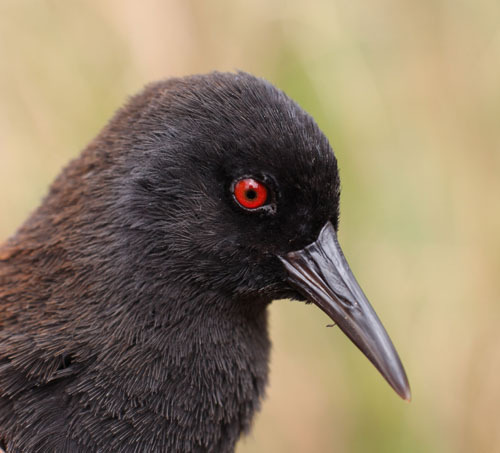 Comparing the sequence data from this sample to sequences from other rails around the world, he was able to show that the Inaccessible Island Rail's closest living relatives are the Dot-winged Crake in South America, and the Black Rail in South and North America. Moreover, the degree of divergence from these species suggest that rails reached Inaccessible Island about 1.5 million years ago - quite recently relative to the radiation of species in the family. 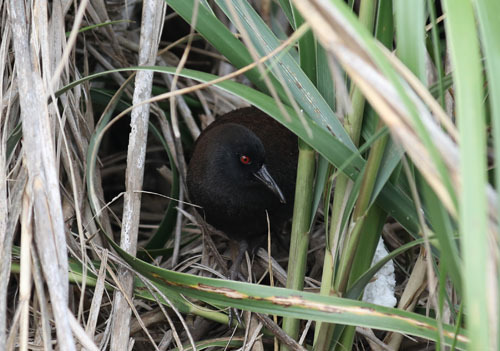 The Inaccessible Island rail is one of the last surviving representatives of the diverse radiation of flightless rails that once graced the world's islands. This highlights the importance of preventing the introduction of rodents or predators to oceanic islands and the need to support their removal whenever success for such endeavour is deemed possible. 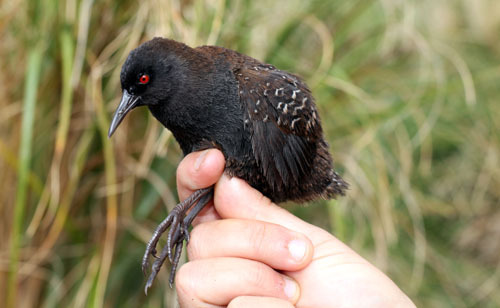 "The origin of the world's smallest flightless bird, the Inaccessible Island Rail Atlantisia rogersi (Aves: Rallidae)." Molecular Phylogenetics and Evolution, 130: 92-98. Peter Ryan who is Director of the Fitz Patrick Institute of African Ornithology at the University of Cape Town.